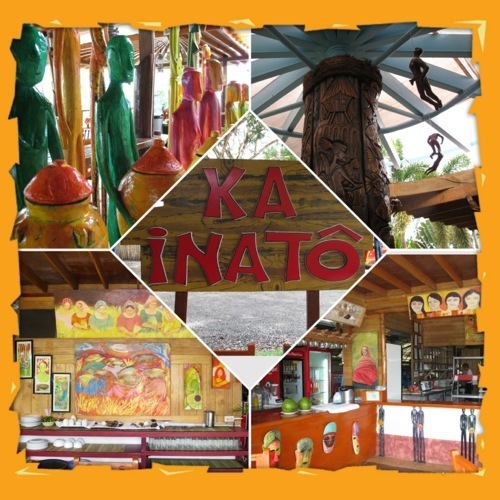 Ka Inatô was a surprise waiting for us. 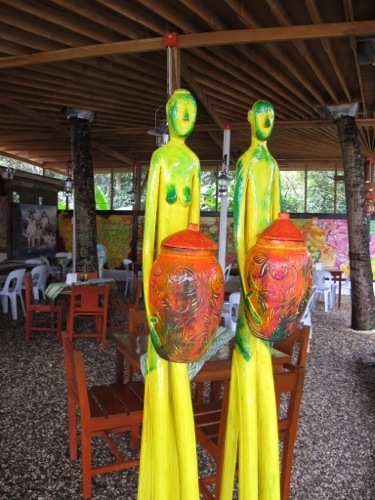 It wasn’t planned, but Ka Lui was closed on the day we arrived in Puerto Princesa City. Our 3rd disappointment after a flight delay of 2 hours and a cancelled Underground River Tour. 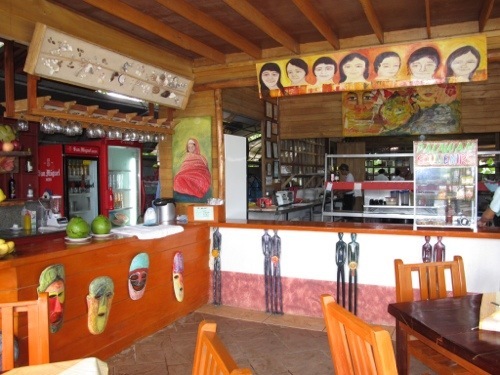 Our van driver suggested lunch here before our northbound trip to El Nido. Well along the way, Ka Inatô is in Rizal Street just as you approach the exit out of the city center. Ka Inato along Rizal Street just as you approach the exit out of Puerto Princesa City. Interesting wooden sculptures. Very artsy. I’ve read somewhere that Ka Lui partly owns Ka Inatô. If true, it explains the “KA” in the name, the ambience and the food quality. It’s unconfirmed, but let’s just say I wouldn’t be surprised. 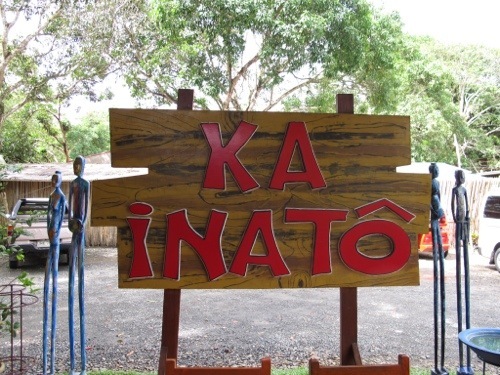 I wanted my family to experience dining in Ka Luí but the place was closed. So was Kinabuch’s. My apprehension over Ka Inatô was completely wiped out upon seeing the place. Very charming. Very artsy. Open air. The wind chimes add to the rural, carefree ambience. 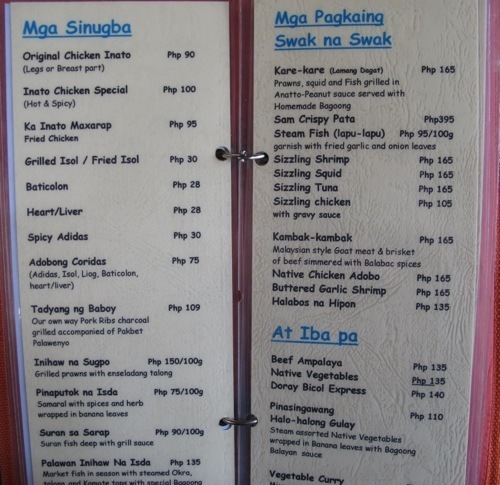 I love how this resto was laid out. Simple decor but each item placed somewhere with careful thought. This corner reminds me of a rural sari sari store. The paintings are of children exuding innocence and fun. 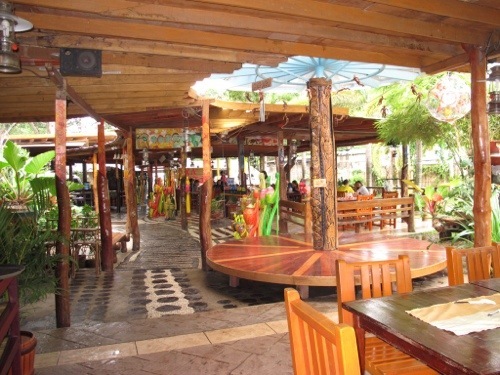 The “open air” atmosphere added to the ambience. 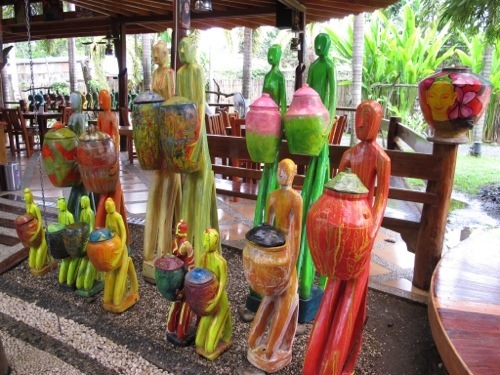 The wooden sculptures, paintings and hanging chimes all combined to give a local flavor. We were early for lunch so it was not a problem choosing a table. Judging by the menu, the place caters to all clientele. 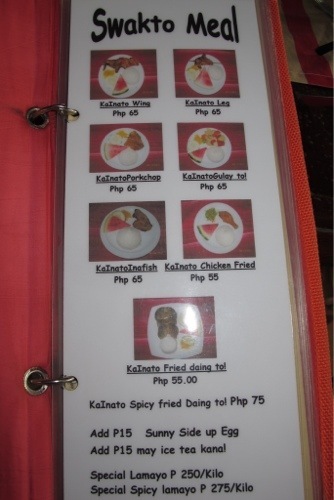 Pinoys would love the local cuisine. As well as the seafood dishes. 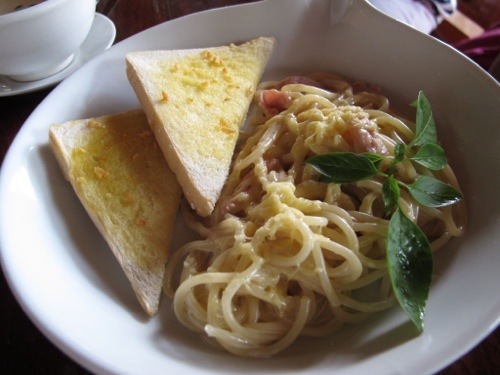 Then there are pasta dishes for the foreigners …. and for the teenager in our group. Fruit shakes and frothy iced teas complete the deal. Somehow, I feel like I’m in some gallery somewhere in Angono, the art capital of the Philippines. Service quality was likewise commendable. The service crew was most attentive despite our indecisiveness over what to order. Bless the children in our group who knew exactly what they wanted to eat while the adults agonized over what to order. 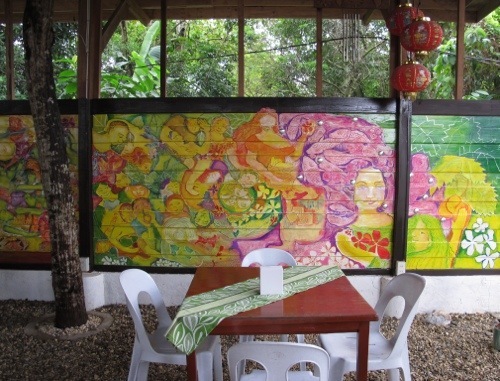 Love the colors and the layout of this resto! Everywhere you look, there would always be a piece of art inviting a lingering look. Art surrounded us while we waited for our lunch. Somehow, I felt I was in some gallery in Angono, Rizal. There were enough art items inviting our attention. And the food didn’t disappoint. LUNCH! 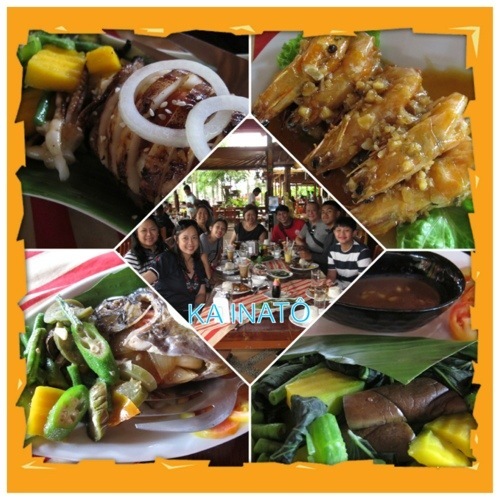 Freshly-grilled stuffed squid, shrimps in some savory sauce, steamed veggies wrapped in banana leaves, grilled fish with vegetable sidings. Yummy lunch! This is their signature dish. Chicken Inasal to many. Inato here in Palawan. The Pasta dish didn’t disappoint too! 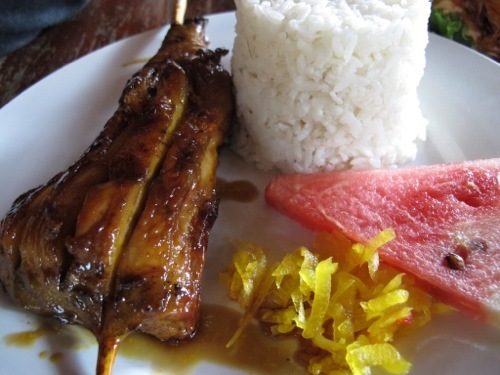 Ka Inatô’s signature dishes include their local inasal (called inatô) or grilled chicken. But we won’t be deprived our seafood favorites and guilt-diffusers like steamed veggies. The kids ordered their favorite shakes and iced tea. I have to say that food presentation pleased the senses. Simple. Not exactly a cut above the rest, but for the price tags, I’ve got to say Ka Inatô knows how to please their guests. 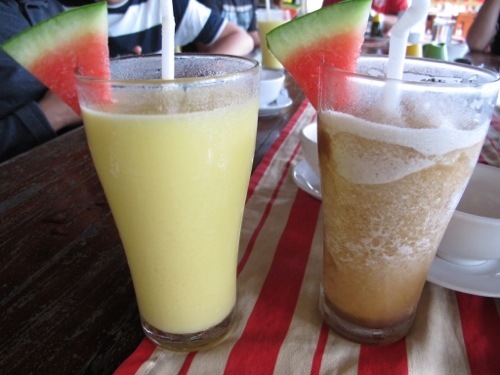 Fruit Shakes and Frothy Iced Teas! And there’s more at very low prices. There’s a meal for every budget !